Accessories.Woot was launched on June 3rd 2013 and is apart of the Woot family of deal sites which has been in business since July 2004. As with all the other sites that Woot operates, Accessories.Woot offers one day only deals but on accessories and watches. Accessories.woot.com currently ranks #12 amongst sites offering online deals -- DX Offers ranks #11. In the General Merchandise category, Accessories.Woot ranks at #9 -- Deals.dx.com again ranks slightly higher at #8. 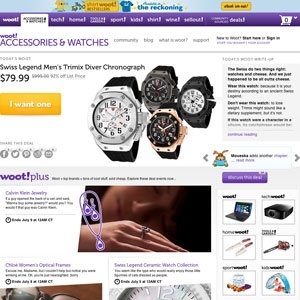 Accessories.Woot is considered the most popular deal a day site, ranking in at #1. As for the 2nd most popular site, it's Giveaway of the Day.